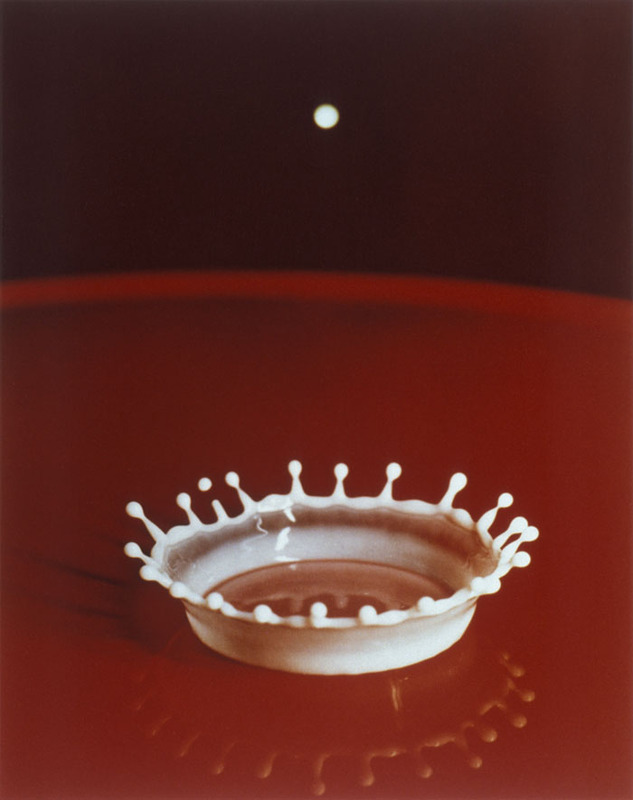 This photograph captures a sliver in time—1/10,000th of a second, to be exact—when a drop of milk splashes and curves upwards to form an opalescent crown. The photographer spent two decades trying to capture the perfect milk coronet, until he snapped this color shot in 1957. He was Harold “Doc” Edgerton, a professor of electrical engineering at the Massachusetts Institute of Technology. Known as “the man who made time stand still,” he laid the foundation for high-speed photography with his innovations in flash technology. “Harold Edgerton combined modern electronics with improved flash tube technology to create very bright, short duration, precision control of light,” says Kim Vandiver, a former colleague and director of MIT’s Edgerton Center, founded in 1992 after Edgerton’s death in 1990. The flash he developed was briefer than ever before, and allowed photographers to capture fleeting moments that go undetected by the human eye. Edgerton revolutionized glass flash tubes, the capsules that illuminate subjects when photographs are taken. He filled the tubes with xenon, a highly conductive gas that, when triggered by an electrical charge, fires off flashes that are exceptionally bright and brief—mere microseconds long. (One microsecond is 1/1,000,000 of a second). “The light itself essentially acts as a shutter,” Vandiver explains—the camera only captures what’s visible in that fleeting moment of illumination. The engineer began artfully freezing fragments of time, such as the moment a bullet exits an apple, or a hammer shatters glass. “The images that you see are iconic in the 20th century,” says Deborah Douglas, curator of science and technology and director of collections at the MIT Museum, which showcases Edgerton’s work. His milk droplets (he made multiple) are among the most memorable. To capture his famous coronet, Vandiver recalls, Edgerton connected a camera to his xenon gas flash tubes and positioned it in front of a drip that steadily released droplets onto a red pan. He chose milk as the liquid, because of its high contrast and opacity, which made it seem solid when frozen by the camera’s flash. The challenge was to trigger the flash just as the milk collided with another droplet on the surface below and unfurled into the delicate coronet. “It’s a matter of a 1,000th of a second—and the right 1,000th of a second—to get that crown,” Vandiver says. The human eye wasn’t reliable, so Edgerton used the plummeting drop itself to trigger the flash. He crossed its path with a beam of light connected to a detector. When the liquid bead fell, it briefly blocked the light, registering as a shadow on the detector and causing a voltage pulse, which travelled through an electrical circuit, initiating a flash at a controllable delay. Over the course of his engineering career, Edgerton continued to design powerful flash units, including one for Allied planes in World War II that illuminated enemy territory during nighttime reconnaissance missions. He also improved multi-flash units that were the predecessors to modern-day strobe lighting, commonly found on police cars and airport runways. “He’s permanently in the DNA of all of these things that we use and work with every day,” says Douglas. This entry was posted on Wednesday, July 1st, 2015 at 12:38 pm and is filed under Stories, The Archivist's Blog. You can follow any responses to this entry through the RSS 2.0 feed. Both comments and pings are currently closed.